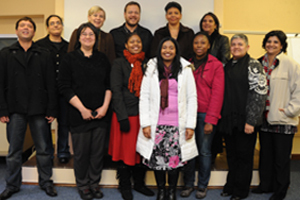 Salegga Valley recently completed a training programme in management run by UCT's Staff Learning Centre, to be awarded a National Certificate in Management. To qualify for the programme, the group had first completed the centre's Supervisory Skills Programme, an eight-day programme that focuses on personal effectiveness, the management function, and building commitment with individuals and teams. The "trailblazers", as the group was affectionately called, then took part in a Recognition of Prior Learning process, a demanding six-to-eight-month programme that required them to undertake practical assignments within their departments.